The M4U 1 and M4U 2 were designed by Paul Barton, the founder of PSB. PSB is a division of Lenbrook, which also owns NAD. So when it came time to do a NAD headphone, Barton was drafted. 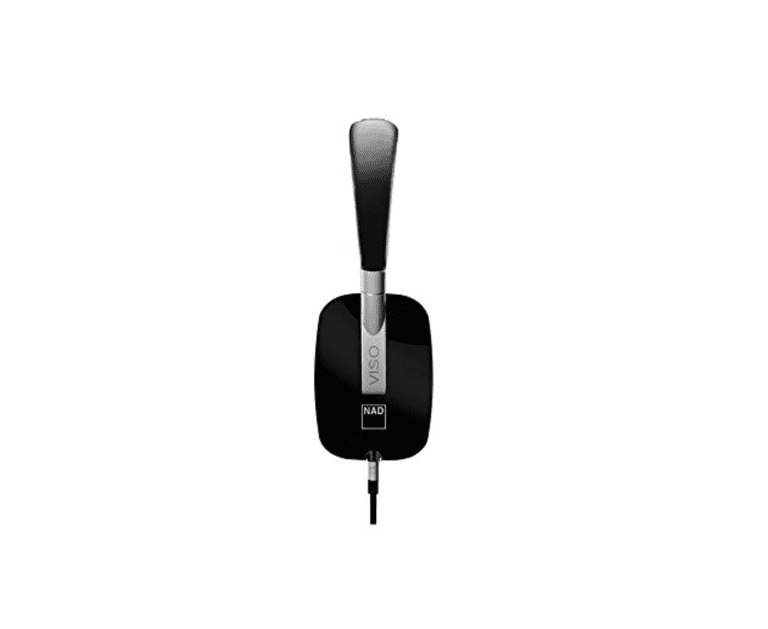 The NAD Viso HP50 headphone isn't a rebadged M4U 1. In many ways, the HP50 a very different headphone. From an ergonomics standpoint, the HP50 is as far above the M4U 2 and M4U 1 as, well, any operating system is above Windows 8. For starters, it's much lighter. The earpieces on the HP50 swivel so the headphone can lie flat, which makes it easy to slip it into a laptop case. It was impossible to fit the M4U 1 and 2 into most laptop cases, at least not without creating a huge bulge in the side. The swiveling earpieces also allow the HP50's padded leather case to be much slimmer than the hardshell plastic case included with the M4U 1 and 2. Thanks to an unusual headband design, the HP50 also fits me better than the M4U 1 and 2 do. With most headphone ear bands, the curvature of the band puts the clamping force at an angle to the side of your head, so you get more clamping pressure above your ear than below it. But the HP50's band's somewhat rectangular shape gives it consistent clamping force all around your ear, making it more comfortable and providing a better acoustical seal on your cheek. During a two-hour jaunt on Los Angeles' Orange Line, the HP50's comfort above-average - although like the M4U 1 and 2, the fabric covering the speaker drivers rubs against the earlobes a little, which can get a little scratchy and irritating after an hour or so. Just one downside to the HP50's ergonomics: the rectangular shape of the headband kind of makes you look like some sort of weird alien from "Star Trek" - a Ferengi, maybe. The No. 1 question for any headphone enthusiast reading this has to be, "How does it compare to the PSB?" The differences among the two headphones are modest, yet still readily apparent. We'd describe both as sounding relatively flat. The HP50's bass is more pleasing; the M4U 1 has a comparatively pumped-up bottom end (what engineers would refer to as a "high-Q" sound). The HP50's treble sounds mildly boosted compared with the M4U 1. This didn't significantly affect the spaciousness or detail, it just makes it sound like someone turned up the treble knob on your stereo by +1 or +2 dB. We could cite all sorts of pieces of music to describe how good this headphone sounds, but we'll start with the Telarc recording of Joseph Jongen's "Symphony Concertante" by organist Michael Murray with the San Francisco Symphony. Not many speaker systems or headphones can convey the majesty of the pipe organ in Davis Symphony Hall, but with the HP50, the sound and the feel was very much like being in the presence of an actual pipe organ. The deep, deep low frequencies sounded perfectly clean, without a trace of distortion. You'll also get a terrific sense of the acoustics of the concert hall. The ambience wasn't exaggerated or hyped-up as it is with many treble-boosted headphones; it just sounded natural. On the loud sections, where the sound of the organ really fills the hall, the reverberance seemed to increase, as it would in the actual hall. Audiophile-oriented, flat-response headphones like the HP50 sometimes sound dull on hip-hop and metal - at least when compared with hyped-up headphones like the Beats New Studio - so we decided to see how Wale's "Love/Hate Thing" sounded through the HP50. In short: really, really good. You'll love the way Wale and singer Sam Dew's vocals are anchored dead center, while the hand claps and finger snaps that keep the rhythm seem to hover a few feet from your head and the backing vocals in the chorus sounded like they were echoing off the walls of a cathedral, about 40 feet away. The bass on this track also sounds great. Maybe it didn't sound as pounding as a lot of people would like, but it sounds ample and full without seeming exaggerated. Flaws? Well, the only one we heard was what sounded like a slight recess in the mid-midrange, which made some voices (James Taylor, for one) seem ever-so-slightly canned - at least relative to the M4U 1, which has a more open-sounding midrange. Bear in mind, the vast majority of the headphones exhibit this character to some degree. To get better sound than the HP50 you'd have to go to an open-back design like HiFiMan's HE-500. But that headphone is grossly unsuited to any kind of portable use. It's open-back (so sound leaks in and out), it's heavy and bulky, and it needs a separate headphone amp (or a really good portable music player) to perform its best. There are lots of headphones out there for a lot of applications and a lot of tastes. There are, especially, a lot of great passive, over-ear headphones (the B&W P7 and the Phiaton MS-500, plus the Sennheiser Momentum and of course, the M4U 1). Of these, the NAD Viso HP50 is our favorite. That doesn't mean it will necessarily be your personal favorite. We recommend you hear as many of these headphones as you can before you choose one. And for air travel, we prefer the Bose QC-15, which is more comfortable and has the best noise canceling of any over-ear headphone.